A mechanical engineer who has spent years on the design side of medtech reviews the evolution of AI in medical devices, and discusses the impact it will have on the industry's future. For years the role of robotics and artificial intelligence within the realm of medtech has been hyped as the future of innovation and device development. Now that technological advances are beginning to catch up to our imagination, how will advanced robotic and AI technologies begin to reshape the medtech landscape? 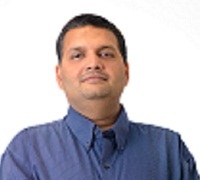 ​​​Srihari Yamanoor is a research and design specialist with extensive experience in medical device design and applications. He has spent years in the medical device field working with computer-aided design (CAD) and robotic technologies and has garnered a wealth of experience with quality engineering and digital health platforms.With advances in machine learning and robotic design, artificial intelligence is poised to have a dramatic impact on the medical device field. With innovative opportunities on both the diagnostic and therapeutic sides of medicine, AI technologies could be the key that unlocks an entirely new generation of transformative medical device technologies. Hear Srihari Yamanoor talk about how artificial intelligence is changing medical devices at the BIOMEDevice San Jose conference in San Jose, CA on Dec. 6, 2017. Yamanoor recently sat down with MD+DI Qmed to chat about the evolution of robotics and AI technologies in medical device field, and assess the role the two will play in the development of devices of the future. MD+DI Qmed: For starters, can you talk a little about the evolution of robotics and AI technologies within the medtech realm? How quickly are AI technologies being incorporated into both the development and functionality of medical devices? Yamanoor: Let us look at robotics first. I see robotics as having four classic categories of applications as medical devices. The first is in production and quality assurance., the second is as surgical medical devices, the third is as exoskeletons and in other instances, enhancing human abilities providing assistive care, and the fourth category where robots are used in settings such as elder care, hospitals, as well as in pharmaceutical settings, assisting in fulfilling prescriptions, etc. Interestingly, in many of these categories, growth is being driven by high technology organizations, sometimes in collaboration with existing medical device organizations, but there are also several emergent organizations that don’t fit this bill. The influence of robotics and the use of robots themselves as medical devices is only going to increase rapidly over time. There will also be a lot of competition and consolidation, and this is a very interesting space to watch. Machine learning (ML), a subset of technologies that constitute AI, is being readily incorporated on the application side, in diagnostics. The field of diagnostics will see a sea change over the next few years, and along with it, medical devices used in diagnostics will evolve. Machine learning, through edge computing, a component of the Industrial Internet of Things (IIoT) is also finding its way in world class manufacturing facilities. Edge computing is also ripe for innovation in healthcare because patients, and even people who use wearables on a regular basis, can find immense benefit. Similarly, machine vision is finding application in manufacturing and quality assurance. Vision has actually found itself a stable and growing base in medical device manufacture and assembly, and this is very good news. This improves product quality, in all areas, ranging from assembly, testing, quality assurance, packaging, and beyond. MD+DI Qmed: What are the most prominent areas that are being impacted by AI technologies and robotics? In what ways are researchers looking to incorporate AI technologies into the functionality of their device? Yamanoor: As mentioned before, currently, the low hanging fruits for the various emerging subsets of AI – vision, and learning, for example, are in manufacturing, quality assurance and in diagnostics. Oncology is a field where there is a lot going on by way of experimentation. IBM’s Watson is being used by different medical centers and has been met with both praise and criticism. That indicates there is room to grow for competitors in this space. Another area for innovation is in treatment planning, for radiotherapy and chemotherapy. At least currently, it appears the data-intensive nature of every aspect of oncology, and the consequent focus on this area by several organizations will drive adoption first. With lessons learned here, this will expand to other areas of medicine. In addition, medical robotics is ripe for the incorporation of maturing AI technologies, since it is either already equipped, or can be quickly upgraded to include the infrastructure necessary to collect data, process it, and benefit from the insights. Surgical robotics is sure to be next in terms of implementing AI. One thing to watch for is how regulatory agencies will respond to newer systems, focused on learning and autonomy. In the U.S., Scott Gottlieb, the current FDA commissioner, has appeared supportive of efforts to incorporate emerging technological solutions in practice, especially in digital health. In remarks earlier this year, he also indicated that predictive algorithms, still in development will be used in classifying tumor dynamics. Gottlieb’s approach has generally won praise all around, from industry, predecessors, and others. Should he extend his support to the critical examination and regulatory approval of AI-based solutions as they emerge into practice, and are submitted for approval, then adoption will happen at a rapid pace across the industry. Acceptance by regulatory agencies, will, without doubt, be key in determining the pace and level of the adoption of newer products and solutions. MD+DI Qmed: What kind of an immediate impact do you think AI technologies are robotics will have in the next few years? Do you think they’ll have a bigger role on the development side of devices or the operational side? Yamanoor: 2020 is around the corner. The biggest and most immediate impact will be in operations. In addition, AI will start making roads into [device] design in the near future. CAD product and service vendors will likely start competing in providing tools that help designers automate routine design tasks, as well as take advantage of AI in improving their designs. Robotics will continue to evolve to use machine learning and deep learning, especially in areas of medicine and healthcare that present fewer regulatory burdens. We are already seeing vastly improved voice recognition in smartphones. Robots used in elder care and the care of patients with special needs will see the rapid integration of such technologies. Additionally, robots and systems used in manufacturing will also continue to implement improved machine learning and machine vision, not only to improve production quality, impacting error rates, product security, tamper proofing, and other features. MD+DI Qmed: How important of a role do you think machine learning will have in the medical devices of the future? What kind of an impact can machine learning and deep learning technologies have on the next generation of medical devices? Yamanoor: Physicians and other Healthcare Professionals are already becoming comfortable with the application of machine learning in diagnostics and robotics. Similarly, patients and health conscious end users are becoming comfortable with devices that use machine learning, to help with physical activity tracking, blood glucose monitoring, insulin pumps and related applications. Thus, it would behoove organizations to drive the use of machine learning to improve competitiveness and device adoption. Device designers would serve themselves well by starting to design devices with sensors, making all manner of data collection on device use and function. Using ML and DL algorithms, they can then analyze the data to gather key insights that drive better device design through design for manufacturability, applicability, service and also determine how to increase service life, ease of use and other factors. Yet another area of impact that seems distant now, but will find application in the medical device design, will be the customization of devices specific to patients, vastly increasing the application of precision medicine. Devices can be tailored to a person’s body conditions, disease progression, age, anatomical dimensions and other factors. Two areas where the inability to do so plague healthcare today is cancer therapy and pediatrics in general. Artificial intelligence can be used to design and apply devices effectively to meet these and many similar challenges. In a related manner, the health insurance industry will use machine learning to optimize and reduce the cost of care, and while this will have an indirect effect on medical devices, it will affect everything from reimbursement to competition among organizations. Similarly, data obtained from Digital Health devices, such as in physical activity tracking, blood glucose monitoring, insulin pumps and the like, will also be used by the Insurance industry to identify at-risk patients and provide them with assistance. Some of this is already happening. The addition of algorithmic learning as a component is not far away. FDA is beginning to recognize the importance of mobile devices and software itself as medical devices. Gottlieb has prioritized innovation in regulatory approval for such categories. This will also drive interest in both areas, and machine learning and deep learning will find yet another obscure class of devices that could qualify as medical devices, which are those used in medical education. That industry will also benefit from the emergent innovations in robotics and artificial intelligence. MD+DI Qmed: How close are we to a world where AI and robotic technologies are ubiquitously used to diagnose and treat patients? Is that really even achievable? Yamanoor: Regardless of all the predicted improvements in the use of AI and robotics in healthcare, we are decades away from reaching ubiquity. And the ubiquity will come with limitations for a long time. The practice of medicine is a combination of science, technology and a certain level of artistry, with human judgment playing a key role. Translating this practice into robotics and AI will take time, resources and effort independent of what is already being consumed in the industry. Medicine is heavily regulated and this will also cause delays in accomplishing this ubiquity. However, it is possible for us to imagine a future in which Robotics and AI will be a near-universal presence, aiding doctors, nurses, emergency responders, and other practitioners wherever possible. Some of this will be driven by necessity as humans begin to explore space and venture into remote locations across the Earth. There are stumbling blocks ahead, such as the potential end to Moore’s law, the proverbial sword of Damocles always appearing to dangle on the semiconductor industry. However, advances in quantum computing, as well as the practice of telemedicine, with the advent of networking technologies such as 5G and whatever lies beyond, and advances in other areas will continue to drive improvements in the use of AI in healthcare. As you can see, it is hard to predict the future that [far] in advance, and skeptics are well positioned to argue that we have seen several “AI winters” before and that we are currently, potentially, in the midst of an AI hype cycle. However, as we have seen, in most fields, except for a select few, such as in nuclear energy (even this field has had limited success and several useful analogs, including nuclear medicine), once the hype cycle has passed, meaningful applications and commercial successes do emerge. However, recognizing the benefits already realized, and the potential for growth in the near future, the medical device industry should not hesitate in inculcating the data-driven development and operational culture to prepare for the future. Certain aspects of AI may or may not be realized, but machine learning, deep learning, and ever-increasing performance of hardware and data processing, along with better algorithms are here to stay even if their progress is slowed or even hampered from time to time. Organizations that strategically plan well in advance, thinking in systems, will be the most successful in staying competitive in this future. We should also fully expect the high technology industry to aggressively compete against traditional device organizations. To a large extent, we already see this in medical and surgical robotics as well as digital health. MD+DI Qmed: Do you foresee a future where robotics and AI technologies can operate autonomously in healthcare? Or do you believe these technologies will always be accompanied by medical professionals to oversee their performance? Yamanoor: Yes and no. Robotics and AI will be designed and developed to operate autonomously. However, there will be some key considerations. One is efficiency and effectiveness. Currently, for example, when machine learning is used in diagnosis, it is used as an aid, essentially because there are performance limits and non-trivial error rates associated with these systems. The other factor is criticality of the function being performed. You will be okay with an elder care robot dispensing medications per plan, and even deviating to modulate the dosage where necessary. You will, however, treat an important procedure as critical. Thus, a human would intervene, at least to concur with the decision that the procedure is necessary, if not to perform it as well. There is an emerging concept in AI, termed “human in the loop.” This is mainly to help fill the efficiency and effectiveness gaps of AI-based systems. If you think about self-driving cars, given that the technology is not perfect, given all the variables, there is always the fail-safe; an alert human operator is expected to take control when necessary. It can be readily understood that doctors, nurses, emergency health responders, pharmacologists, and other healthcare practitioners will become the “human in the loop,” always ready to take over from the robot or AI system, even if they are present remotely. MD+DI Qmed: Finally, are there any misconceptions or general misunderstandings about robotic and AI technologies that you believe could use some clarity? What do people need to know about the future of these technologies with respect to their potential impact on the medical devices of the future? Yamanoor: The first misconception is about jobs. There is a lot of talk about AI, and robotics in particular, snatching jobs away from practically everyone. Interestingly, almost every new technology has been used as a bugaboo about the disappearance of jobs. This does come true when a particular technology displaces a certain type of labor or job. It is important to understand that the nature of the labor changes, and that with sufficient preparation, one can prepare oneself for the onslaught. Those in the industry today, and students who plan to enter the design and engineering profession in due course, including yours truly, need to prepare for the changing landscape wrought by machine learning and vision, deep learning, and AI. Anyone who dallies around this is putting their own progress at risk, and ultimately, technological progress is not to blame. The same is true for organizations. The second misconception is the dramatic notion that AI will somehow cause all manners of doom and catastrophe. Again, ironically, this was once thought to be true of steam engines and other innovations. However, as Jerry Kaplan rather ironically and humorously points out in his short, must-read treatise on artificial intelligence, most of these fears are misplace and arise from the rather opportune choice of the term AI itself, coined by John McCarthy in the summer of 1955. Had he given this combination of science and engineering a different name, perhaps, the mythology and the very trajectory the field has taken might have been different. And, it is important to remember, most of the focus on AI is to not create self-aware monstrosities, but to automate learning and achieve a level of rapid and effective cognition through computers to aid humanity. This is not to disparage the exercise of ethics in every aspect of scientific research and engineering. The third one relates to some of the points I made earlier. Healthcare is a highly specialized field, and the purpose of AI, machine learning, vision, and other solutions should be to aid the specialists and not displace them. As popularized by the iconic and inspiring book and the accompanying movie, Hidden Figures, very intelligent humans once had to toil away performing tasks that were extremely critical in their time, but today, are quite mundane. While, the work of Katherine Johnson, Dorothy Vaughan, and Mary Jackson are nothing short of historic, current technological innovations allow the scientists of today to work on newer and different, yet critical problems and solutions. Similarly, by removing the need for healthcare scientists and practitioners to work on routine tasks, AI and robotics will enable them to further specialize in solving specialized, critical healthcare problems. And that, I hope is a promise that we can all agree should be realized. Thus, the career plan for the future healthcare professional lies in adaptability and forward-looking specialization, and focus on problems that need solutions. As I have noted before, the very term Artificial Intelligence may be overly optimistic. We are just as likely to get Artificial Mediocrity, if not Artificial Stupidity. In this regard reticence, regulation and delay may do more to protect us than hurt us.